The Beauty of Life: Take a Peek at the Beauty Products In My Purse Today! Take a Peek at the Beauty Products In My Purse Today! I decided to give you a little peek into the beauty products jumbled up in my purse today! Check out what I'm currently trying and loving. Dr. Dennis Gross Skincare Hydra-Pure Firming Serum: One of my all-time favorite products! This serum makes my skin look AMAZING -- glowy, refreshed and baby-soft. M.A.C False Lashes Extreme Black Mascara -- If you want false lashes without the annoying application and weird feeling they leave behind (seriously, when I wear them I can't stop blinking), this is the mascara for you. It lengthens, it thickens, it curls ... it makes lashes hit glasses. Guaranteed. Fresh Sugar Passion Lip Treatment: Much like its predecessors, this lip balm imparts subtle color (in this case, a gorgeous pinkish red) and makes lips feel absolutely kissable. Paul Frank LipSmackers in Mika's Sweet Cream and Worry Bear's Honey Sweet: Lip balm that softens and smooths for hours ... and tastes fantastic? It's these adorable little tubes. 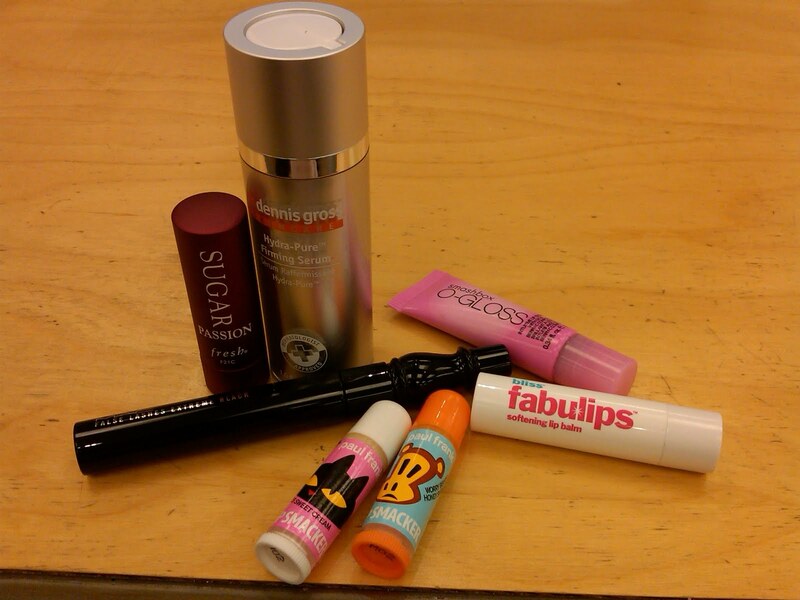 Bliss Fabulips Softening Lip Balm: Sensing a lip balm obsession here? This one is great for all-day wear, not to mention all-night wear -- slick it on before bed and your lips are still soft in the morning! Smashbox O-GLOSS: Want a customized pink pout? This is the gloss you NEED to try. It slicks on clear, then turns a totally gorgeous (and totally unique) shade of pink that I swear garners tons of compliments! What beauty products are in your purse today? Let me know in the comments!